Las Vegas is a city that needs no introduction. But with its five-star resorts, world-class restaurants and boutiques, and spectacular entertainment and nightlife, Nevada’s largest city has long outgrown its adult playground connotation. It has truly earned its spot as one of the world’s premier tourist destinations, and no one can accuse Las Vegas of being a one-trick gambling pony these days. The famous Las Vegas Strip is still lined with flashy mega-resorts, but venture past the flashing neon and dazzling lights, and you may be surprised by what you find. Each grand building is a destination unto itself, bursting with magnificent amenities and attractions for all. As spectacular as the resorts are, the events they offer nearly nightly are just as impressive. Las Vegas shows are as well-known as the city itself, and they don’t disappoint. Masquerade balls, magic shows, comedy acts, headliner concerts, theatrical performances, symphonies – the list goes on and on. No matter when you visit, there’s a show to see. If a dose of education with your vacation is appealing, we’ve got options for that too. Springs Preserve is a fun way to learn all about the desert surrounding Las Vegas and the, Nevada State Museum also features many informative exhibits and displays. Las Vegas is generally used to describe not just the city itself, but areas beyond the city limits—especially the resort areas on and near the Las Vegas Strip—and the Las Vegas Valley. The 4.2 mi (6.8 km) stretch of South Las Vegas Boulevard known as the Las Vegas Strip is in the unincorporated communities of Paradise, Winchester, and Enterprise, located in Clark County. The peaks surrounding Las Vegas reach elevations of over 10,000 feet (3,000 m), and act as barriers to the strong flow of moisture from the surrounding area. Las Vegas climate is a subtropical, hot desert climate, typical of the Mojave Desert in which it lies. The city enjoys abundant sunshine year-round; it has an average of about 310 sunny days per year. It is virtually free of tornadoes and ice storms. Dew points in the summer are exceptionally low, ranging from 40.6 °F (4.8 °C) to 44.0 °F (6.7 °C). Las Vegas’ winters are short and the season is generally mild. December, the coolest month, averages 47.7 °F (8.7 °C). The mountains surrounding Las Vegas accumulate snow during the winter, but snow is rare in the Las Vegas Valley itself. Temperatures reach the freezing mark on 16 nights of the year but rarely sink to 20 °F (−7 °C). Most casinos in the downtown area are located on the Fremont Street Experience, The Stratosphere being one of the exceptions. Fremont East, adjacent to the Fremont Street Experience, was granted variances to allow bars to be closer together, similar to the Gaslamp Quarter of San Diego, the goal being to attract a different demographic than the Strip attracts. The year 1931 marked the opening of the Northern Club (now the La Bayou). The most notable of the early casinos may have been Binion’s Horseshoe while it was run by Benny Binion. Boyd Gaming has a major presence downtown operating the California Hotel & Casino, Fremont Hotel & Casino and the Main Street Casino. Other casinos operations include the Four Queens Hotel & Casino, Las Vegas Club and Mermaid’s Casino, which are also located downtown along the Fremont Street Experience. The center of the gambling and entertainment industry, however, is located on the Las Vegas Strip, outside the city limits in the surrounding unincorporated communities of Paradise and Winchester in Clark County. The largest and most notable casinos and buildings are located there. RTC Transit is a public transportation system providing bus service throughout Las Vegas, Henderson, North Las Vegas and other areas of the valley. Inter-city bus service to and from Las Vegas is provided by Greyhound. A bus rapid-transit link in Las Vegas called the Strip & Downtown Express with limited stops and frequent service was launched, and connects downtown Las Vegas, the Strip and the Las Vegas Convention Center. As spectacular as the resorts are, the events they offer nearly nightly are just as impressive. Las Vegas shows are as well-known as the city itself, and they don’t disappoint. Masquerade balls, magic shows, comedy acts, headliner concerts, theatrical performances, symphonies – the list goes on and on. No matter when you visit, there’s a show to see. We’ve got options for you. Actividades de pared a pared en Las Vegas significa que usted obtiene más en sus vacaciones. Usted no va a encontrar más cosas que hacer que en Las Vegas. Hay una razón porque la gente dice: “Sólo en Las Vegas.” Eso es porque cuando estás aquí, encontrarás muchas cosas que te sorprenderán. RTC Transit is a public transportation system providing bus service throughout Las Vegas, Henderson, North Las Vegas and other areas of the valley. Inter-city bus service to and from Las Vegas is provided by Greyhound. A bus rapid-transit link in Las Vegas called the Strip & Downtown Express with limited stops and frequent service, and connects downtown Las Vegas, the Strip and the Las Vegas Convention Center. 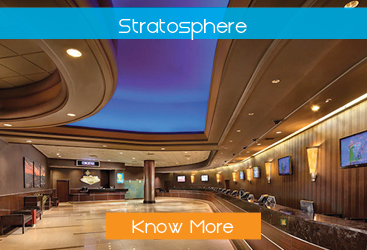 The Stratosphere Casino, Hotel & Tower offers some of the best Las Vegas hotel values on the Strip.